We're proud to introduce our Smart Cycling Quick Guide. 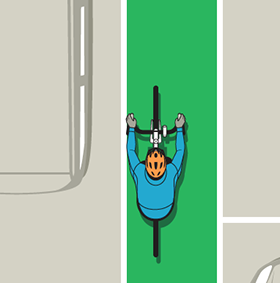 It's an easy-to-read booklet that outlines the basic rules of the road, components of a bicycle, and all of the information you need to ride a bike safely and confidently. Preview the Quick Guide by clicking on it below; purchase Quick Guides at the League Store. The more you purchase, the less you pay per guide. We can offer co-branded quick guides with your organizational or corporate logo on the guide; contact education@bikeleague.org for pricing. Minimum order for co-branded guides is 2,500. This Quick Guide is just one of many resources the League's Smart Cycling program has to offer. If you like what you see and want to see more of it in the hands of future bicyclists across the country, make a tax-deductible gift by clicking on the "Support Smart Cycling" button at the bottom of this page. Smart Cycling Manuals and Illustrations are also available for purchase. Interested in the basics? Watch and share our short, informational Smart Cycling videos. The League's Five Rules of the Road are the core of the Smart Cycling curriculum. Review them here. League Cycling Intructors across the country are teaching new riders and certifying new instructors all the time. Join them. Help spread this important work by buying Quick Guides to share in the classroom, on the road or in your office. Click here to preview. Education has been a core activity of the League's since the late 1970s. Virtually every state and local bike ed program can trace its roots directly back to Smart Cycling.